I recently read an interesting post from Leigh Russell, author of the Geraldine Steel series, in which she reminds readers of the value of having a publisher. Having recently started work on a set of humour ebooks, along the lines of The Little Book of Cynics, I found myself smiling at her post. She's right, of course, that having a publisher (and an agent, come to that) enables a writer to concentrate on what they do best (and enjoy the most! ): writing. I'm an advocate of self-publishing, initially by necessity and now by choice. I submitted my fantasy, Covenant, to more agents and publishers than I could shake a manuscript at. There were one or two nibbles, but in the end none of them came to fruition. 2. It would put the book out there for public scrutiny, allowing for the prospect of feedback and reader engagement. 4. It would pave the way for book sales and all the good stuff we associate with being a successful writer. To date, I've had a magazine review Covenant and I've made some money. However, as an indie / self publisher, you not only wear many hats, you're also responsible for not dropping any of them. You get 100% of the choice and 100% of the responsibility for making it all happen. But we're skirting around one of the issues here; we're avoiding the literary elephant in the room. No, not this one - the other one: literary achievement. The argument runs that becoming a selfie will most likely end in financial disappointment, whereas conventional publishing... Well, that's the thing about publishing - there are no guarantees. Delving into any bargain bucket will show you that. I think that writers need to have a mature conversation with themselves and with one another. We're not all going to the prom, as I'm fond of saying. In the cold light of day my fantasy, Covenant, will never trouble the bestseller list, regardless of how it's published. That doesn't mean it's without literary merit (however that's defined), or that it won't show a healthy profit over its lifespan. I decided to produce four little books because I'd written material that really didn't fit anywhere else. I did approach some humour publishers, but nothing materialised, apart from an honest and interesting conversation about the economics of impulse purchase / gift titles. Mindful of that discussion, I've opted for ebooks. It's an easier, lower cost route to market and, given the proliferation of devices and platforms, coupled with the unit price, it makes more sense. 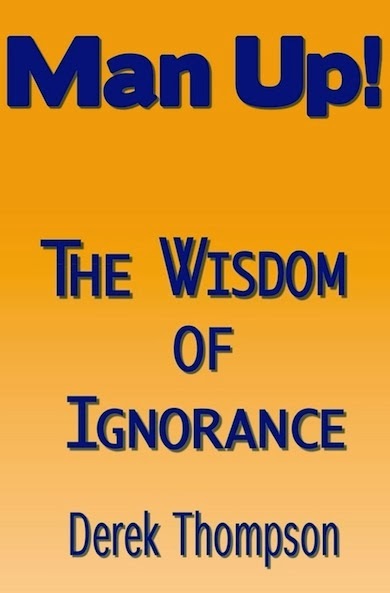 Man Up! The wisdom of ignorance. The male mind laid bare. Wise Up! Modern wisdom for those with a short attention span. Newsclash. Real news stories + boredom = satire. The Little Read Book of Project Management. An alternative glossary of terms. Conor Devine, author of Attitude is Everything which we featured on Strictly a few weeks ago, talks about his book in which he outlines his fight against MS. Conor's book is available from Amazon and other bookstores. Labels: ms; books; personal development; publishing.